This wide range of ailments makes preventive care vital for your pet. We recommend pets ages 7 and older undergo a complete physical examination, complete with blood work and associated laboratory tests, at least twice a year. Early detection of these diseases results in faster treatment and better overall health and well-being for your pet. 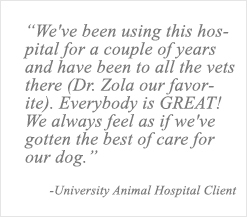 Our veterinarians provide complete veterinary medical care for senior pets. Regular pet exams are the key to keeping your senior pet healthy. 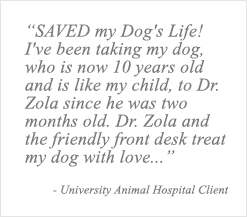 All pet exams at University Animal Hospital include a thorough physical evaluation of your pet. Our veterinarians and staff will provide you with valuable information about keeping your senior pet healthy. Changes in diet and lifestyle, as well as physical therapy for chronic conditions such as arthritis, can help improve your pet’s quality of life. We look forward to helping you and your best friend enjoy many more years together.